The shooting of Iraqi civilians in an incident involving US security firm Blackwater has been the subject of several investigations. The Iraqi government has accused Blackwater security guards of killing the civilians on the morning of 16 September 2007, while they were escorting an American diplomatic envoy in Baghdad. The company said the civilians were killed during a shootout after one of their convoys came under attack in Nisoor Square, in an affluent neighbourhood of the capital. They said the guards reacted lawfully to gunfire deliberately aimed at them. The Iraqi government, citing eyewitness reports, concluded that the Blackwater guards fired on civilians without provocation. The government, which has called for the Blackwater guards to face prosecution, welcomed news that five guards had been indicted in the US in December 2008. Details of the charges are expected to be made public later on 8 December and the five men will surrender to federal authorities in Utah, reports say. Until now, US officials have released few details of the incident as it has been the subject of an investigation by the FBI. However, in November 2007, the New York Times quoted FBI officials as saying that the killings of at least 14 Iraqi civilians had been unjustified. One of the most detailed accounts of the events according to Blackwater employees comes from an initial report by the US embassy. This was seen by the Washington Post at the end of September 2007. It was described as a "spot report" and not intended to be authoritative. It was dated the day of the attacks. According to those accounts, Blackwater teams encountered a car bomb, a shootout and a standoff between Blackwater guards and Iraqi security forces. Each Blackwater team usually consists of three or four armoured vehicles. Another Blackwater unit was dispatched to the scene of the car bomb to deal with the aftermath of the blast. This unit, however, was then ambushed and "engaged with small arms fire" from "multiple nearby locations" in Nisoor Square. One of the Blackwater teams that had transported the official back to the Green Zone was re-dispatched to help out in Nisoor Square. The re-deployed unit found itself stuck at an intersection in Nisoor Square and was confronted by Iraqi police and army. A US forces quick reaction team was sent to help rescue the unit. Separately, The Washington Post quoted a US official familiar with the investigation as saying that at least one Blackwater guard drew a weapon on his colleagues and shouted at him to "stop shooting". Accounts of what happened to the first Blackwater unit to enter Nisoor Square have differed. 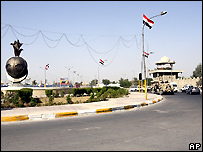 Iraqi eyewitnesses have said that guards moved into the roundabout stopping the traffic. They then fired on a white sedan that had failed to slow down. According to those accounts, the car burst into flames killing the occupants. 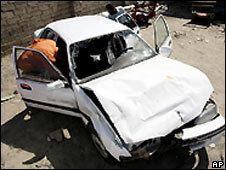 One eyewitness said Blackwater operatives had fired a rocket or grenade into the car. Those eyewitnesses say Blackwater guards then fired without provocation into the surrounding area as civilians and Iraqi officers tried to flee. They say the officers did not return the fire. Also in September 2007, an ABC news report quoted what it said were sworn statements from Blackwater employees. A number of those said that they had fired on the white car after it failed to slow down despite hand and arm signals. Another guard said he returned fire at Iraqis dressed as civilians. Eleven Iraqis were initially believed to have died in the incident, but a further Iraqi government investigation said a total of 17 people had been killed.